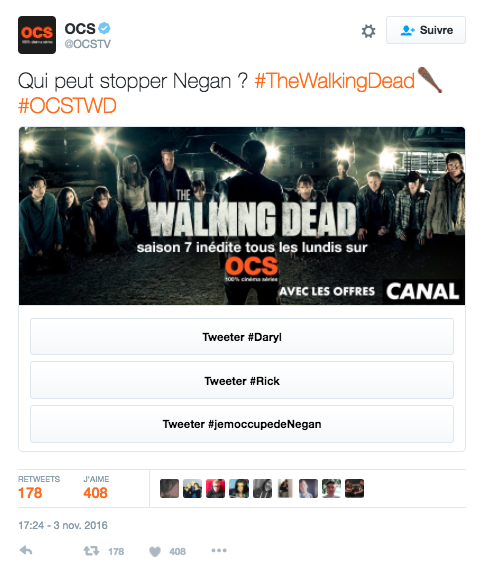 To promote the acclaimed TV Show Westworld, and The Walking Dead for OCS, we designed a Twitter operation. The concept is simple : creating a special relationship between the shows and their fans by asking them what they would do if they were in the show, or what kind of secret is hidden in their favorite show. The objectives was to promote the tv channel broadcasting the shows. Because conversation is exactly what social media is about, we decided to use those infinite conversation about characters or storyline into a marketing operation that would increase the notoriety and the awareness of the shows and the tv channel. For the user who receive this reply it's a new opportunity to share the tweet with his friends and to redo the operation to see what can of answer he'll get from the tweet. Great engagement, lots of impressions and people enjoyed it so much that they couldn't stop tweeting about it ! Your brand can create a great relationship with twitter users if you create a great interaction.